A subtle plain navy blue, our End on End shirts are created using a white warp with a blue weft weaving technique. Made from two-fold cotton poplin and hand stitched to our highest standards, this is a classic shirt that is crying out to be added to your collection. As with all of our bespoke shirts you can customise this to your liking with a full range of customisations available. Just select your preferences above, and we’ll create the shirt you’re looking for. 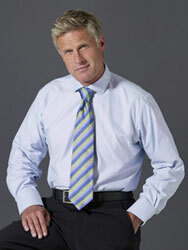 We choose cotton poplin for our shirts because it’s such a durable fabric with a smooth and comfortable finish. 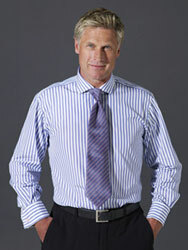 The standard weave gives prominence to the surface colours making it a great choice for end on end shirts.